and assembling, in Okayama ally to manufacture complex aircraft components for our customers. Ikeda Precision Industries Co., Ltd.
Hikari Light Metals Co., Ltd.
Hori Metal Finishing Ind. 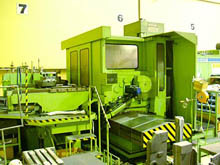 Ltd.
Kurashiki Boring Kiko Co., Ltd.
Nagasaki Iron Works Co., Ltd.
Nakatsuka Iron Works Co., Ltd.
Yasda Engineering Service Co., Ltd. The Machining Division of Mori Machinery participates in the production of components for semiconductor manufacturing machinery, components for FA robots, and components for high accuracy rotary presses. Within these processes, we have established practical technologies in areas such as CAD/CAM, simultaneous 5 axis MC, processing of materials which are difficult to grind, and 3D measurement equipment. By applying these comprehensive strengths to the field of processing components for aircraft, we respond to the needs of customers by performing all of the following steps within our company: proposal of a processing plan, design and manufacturing of processing jigs, processing, and measurement evaluation. The four core technologies that have been refined by the business activities of each of the divisions in Mori Machinery are machine design, electricity and electrons, heat processing and precision machining. We apply these core technologies to all of our products and consult aim for new types of manufacturing. CATIA data is the basis for a series of steps from the creation of programs, the design and manufacturing of jigs, processing, and until the evaluation of measurements. Copyright WingWin Okayama All Rights Reserved.